This year I will be running the Leicester Half Marathon on Sunday 25th October. A complete turnaround for someone who hated running six months ago and couldn't run a mile. A 10k assault course for charity in April whetted my appetite and the next step beckoned. I feel I really have to push myself this year, I'm not getting any younger, I want the physical challenge but the ultimate goal is to represent my heroic wife and the support APP have provided to both of us. Giving something back is of paramount importance to me. My wife encountered PP in summer 2013 after the birth of our daughter and then suffered a particularly nasty relapse in summer 2014. I encountered the comforting arms of APP during and after the relapse. You were there when I needed you and when my wife was well enough, when she needed you. The chance to speak to volunteers and other families going through the same experiences was and still is invaluable as we try to make sense of it all; To learn that you are not alone, despite the apparent destruction of your 'world'. APP has been incredibly supportive of me as a husband, the carer in the bad times. A mentor, a chat on the forum and a chance to shape future care with discussions and taking part in research with Cardiff Uni. If I could grade your support, A*, every time. We’re past halfway, and it feels like we are at a critical point. We’ve had re-tweets from Home-Start UK, Solihull Police, lots of Birmingham-based MPs and TV presenter (and mum) Professor Alice Roberts. And auctioneers Sotheby’s have asked all their staff to vote for us! We’ve also had some unhelpful responses from a variety of organisations, from online sites for parents, to publications for GPs – who typically say ‘we have information on postnatal depression, so we don’t need it on postpartum psychosis’. To which we say – yes you do need it. It is so important that families and GPs are properly informed about maternal mental health. Next week there should be some press coverage and a tiny bit of TV featuring APP. Monday’s episode of ‘Victoria Derbyshire’ on BBC Two/BBC News Channel 9.15 to 11am is all about mental health. Keep an eye on our social media for more info on our media coverage. Please continue your support. Anyone you know you’ve not asked to vote yet – please ask! Do you work for an organisation with a large mailing list or a high circulation newsletter which could put something about voting for us in it? Please ask them. Might you take one of our ‘voting by paper’ forms along to your choir practice, sports team training or work coffee room? Do you have relatives overseas you could ask to vote (votes from abroad still count!). We need more votes and everyone voting is someone who may find out about PP who had never heard of it before – and that can only be a good thing. Thank you, thank you, thank you to all who are working so hard to achieve all we can before the 29th! Work has continued apace to get the word out about the National Lottery Awards – and to get people voting! We’ve added another 500 likes on our Facebook voting page (and are now at 2400) and added 100 new likes on our Action on Postpartum Psychosis main Facebook page. Writer Jodi Picoult retweeted to 111 000 followers, and we had a retweet and support from Norman Lamb. We’ve had support from the South West Strategic Clinical Network and Postpartum Support International. We were mentioned in an article in the Telegraph online yesterday highlighting the need for better mental health services for women in pregnancy and after birth. We’ve also managed a huge mailout to 450 members, sending them our guides, information about our services and a letter about our lottery nomination, with voting information. Special thanks to volunteers who spent a very hot couple of days in the APP office stuffing envelopes. Thank you to all the individuals working so hard – too many to name here – let’s keep on going. One week down – four weeks to go! We’ve made an amazing start to the opportunity given to us by the National Lottery Awards by being nominated to become Health Project of the Year. In the first week of voting we’ve had 1.9 thousand Facebook likes registered on our National Lottery voting page, and been mentioned on Twitter by Ruby Wax, Fern Britton, Denise Welch and Marian Keys. We’ve had support from organisations such as The Marce Society, Bipolar UK, Time To Change, and the Royal College of Midwives. Organisations have tweeted directly to around 187,500 followers, and there are nearly 44,000 followers of organisations who have retweeted our tweets. And in the middle of a very busy week we had a wonderful Family Fun Day where families and friends got together to enjoy a fabulous picnic, play games, chat, raise money for APP and meet others to share experiences of and interests in postpartum psychosis. Oh and of course to vote! Well done and thank you everyone for a tremendous start – let’s keep up this momentum over the next four weeks. 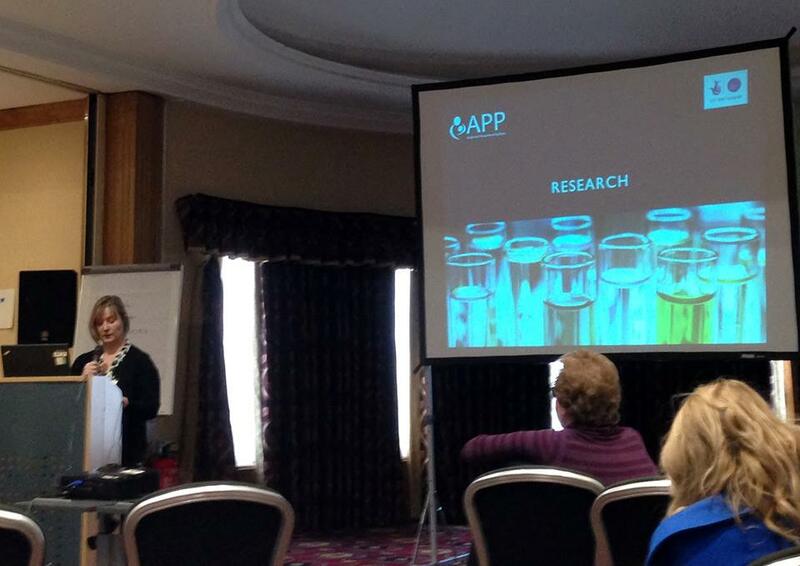 Jo, who is an enthusiastic supporter of APP, is running the Worthing 10K in June and raising funds for APP. "I hope that mothers, partners & families everywhere will sponsor me in order to enable APP to address the ignorance, stigma & lack of provision which it has already done so much to address." Running 10k will not be easy for Jo (is it ever?) so please spur her on by sponsoring her if you can. Let us try together to exceed her target! On Friday, 3rd April Sandra and Bob Chapman of Rosliston celebrated their golden wedding at Hoon Ridge in Derbyshire by kind invitation of Alex & Heather Heron. An afternoon tea party was enjoyed by a very lively group. Sandra is a member of the local "Breakaways" choir who, in between scones and strawberries sang well into the evening . 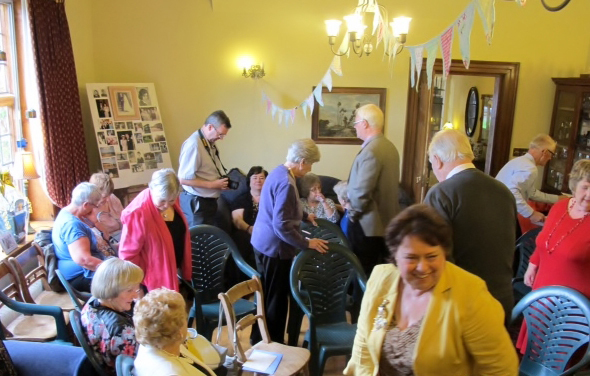 Adrian Blamire entertained the party during the afternoon and Heather spoke about the valuable work of APP. 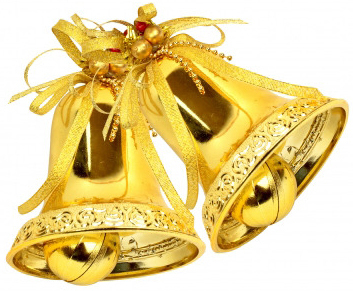 Instead of presents Sandra & Bob asked for a donation to be sent to APP. We thank the happy couple for thinking of APP as they tripped down memory lane with their friends and family. A great sum of £192 was raised. Well done everyone! ...And what a great team of caterers! 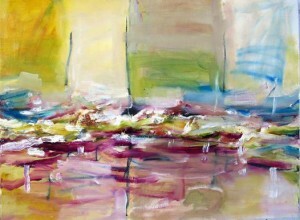 A unique and evocative piece donated by the exciting artist Dale vN Marshall was auctioned in December. After much anticipation and some fierce bidding, we were very pleased the final figure reached £594. We would like to thank Dale and his supporters for this incredible chance to raise money to support, campaign, research, publish, inform and connect to build a better future for all those effected by Postpartum Psychosis. I’d like to add my own personal thanks for creating a remarkable body of work that transcends words and moved me so deeply. 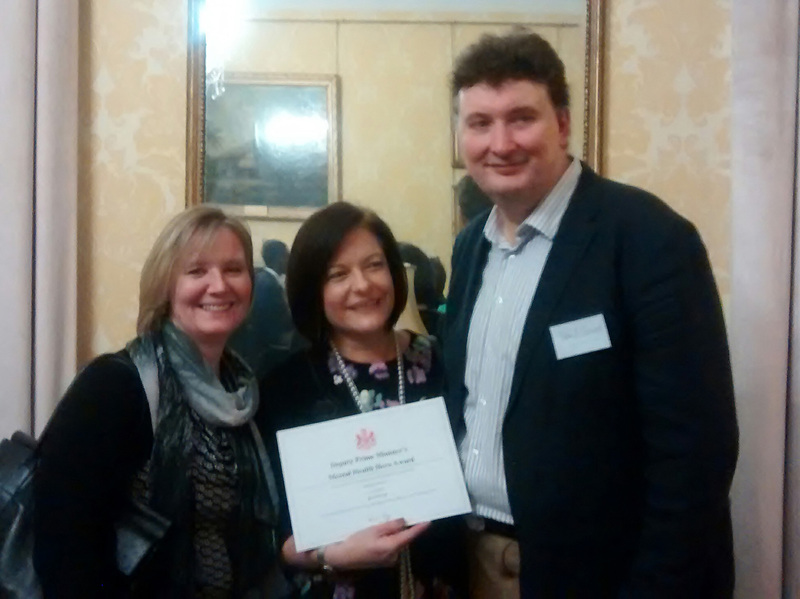 Andrea Lambert, APP’s Peer Support Co-ordinator & Trustee, was delighted to be recognised in the Deputy Prime Minister’s Mental Health Hero Awards 2015. The awards are part of the Deputy Prime Minister’s on-going work to bring awareness and treatment for of mental health in line with physical health. 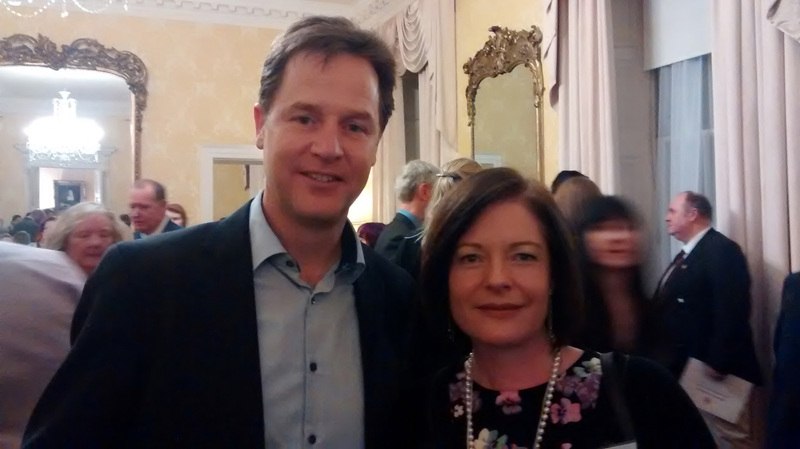 Andrea collected her runner up certificate 'in recognition of exceptional work in the field of mental health' at a reception with the Deputy Prime Minister, Right Honourable Nick Clegg MP. The reception was held in Whitehall, London on Thursday 5 February to mark the launch of ‘Time to Talk Day’. The desire to bring mental health out of the shadows was the theme of the awards presentation reception. “I’ve been overwhelmed by the huge number of responses we’ve had for these awards and the incredible work going on to help other people in their darkest hours. Every single one of them is helping us win the fight to tackle the stigma and prejudice around mental health and build a fairer society where no one has to suffer in silence. In my eyes they are all winners. A warm thank you to all of our amazing supporters & volunteers for their work in 2014! 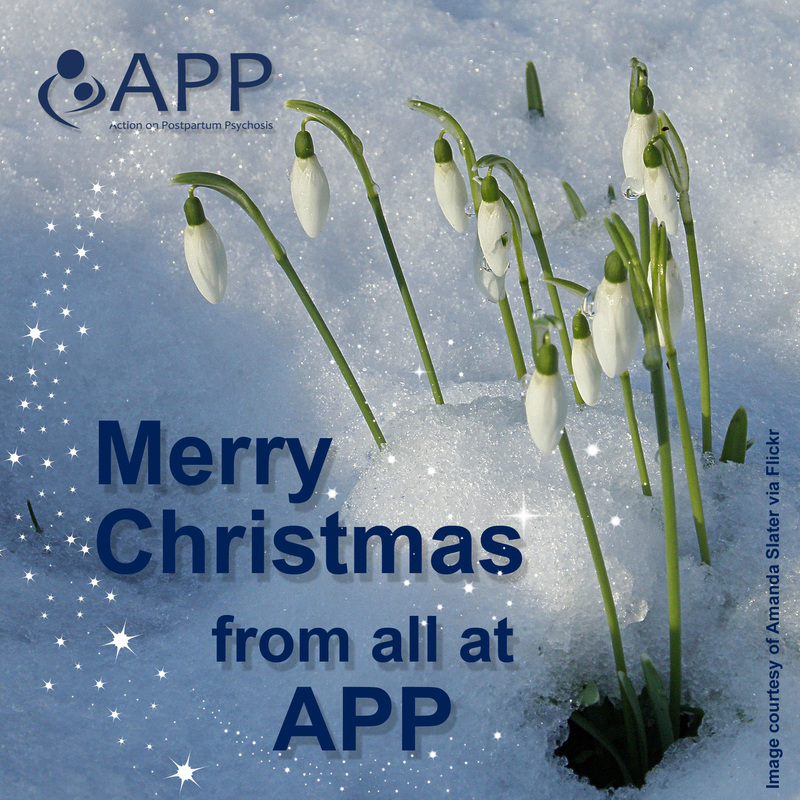 Although progress is never as fast as we’d like, we must remind ourselves that this year we have: trained another set of Peer Supporters to offer support to women and families on our community forum and via email; run an event for new potential volunteers to talk about the work APP does (the largest ever gathering in one place of women who’ve had PP); published a guide for women at risk of PP who are planning pregnancy; published a guide to support women’s partners; expanded our web information and personal stories; set up our network of Regional Representatives, coordinated by Nicola; and begun developing a handbook, powerpoint slides and a training podcast to support the work of our Regional reps.